From 4 to 10 p.m. tomorrow night (April 29), Chili’s Grill & Bar in Redlands will host a fundraiser for San Bernardino Sexual Assault Services. The restaurant will be donating 10% of customers’ bills to the group, which provides support to victims of sexual assault and domestic violence. The group offers its services free of charge to victims and their families and friends. It also works to raise awareness through community education and prevention programs. Chili’s is at 10020 Alabama St.
Click here for more information regarding San Bernardino Sexual Assault Services. Ever dream of strolling beautiful gardens while listening to live music and sampling fine wine and delicious food? Well, now’s your chance to make your dream come true. 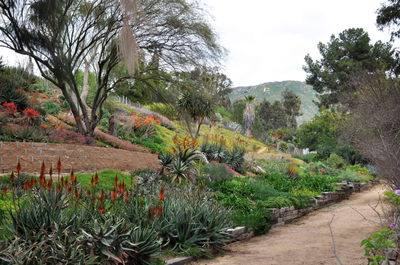 UC Riverside’s Botanic Gardens (seen at left) will be hosting its 11th annual “Primavera in the Gardens” fundraiser from 2 to 5 p.m. Sunday, May 17, in the gardens. Tickets for the wine- and food-tasting event are $50 per person and are available by reservation and at the gate. Appetizers will be provided by prominent Riverside restaurants and caterers, and wines will come from regional vineyards and wineries. Among the more than 30 restaurants, caterers and vintners that participated last year were Mario’s Place, Caf Sevilla, Saffron at the Riverside Art Museum, Trader Joe’s, BevMo! Redlands, The Winery at Canyon Crest, Callaway Vineyards and Winery, Hart Winery and McDonald’s. Um…just kidding about that last one. Live music will be presented by the band Incendio. The event also will include a silent auction, featuring dozens of garden-related items. Proceeds from the event benefit Botanic Gardens projects, including hosting thousands of touring school children each year. To receive advance tickets, reservations should be postmarked by May 8. Make checks payable to UCR Foundation and send to Primavera, Botanic Gardens University of California, 92521-0124. For more information, call (951) 784-6962, e-mail ucrbg@ucr.edu, or go to www.gardens.ucr.edu. Sounds like a lovely time. Hope you call can make it! How do you like your free chicken — one piece or two? The battle of the grilled chicken has begun! In this corner, we have KFC, who is giving away a free piece of their grilled chicken today (April 27). And in this corner, we have El Pollo Loco, who is giving away two pieces of their grilled chicken tomorrow (April 28), along with two tortillas and fresh salsa. KFC is hyping their new grilled chicken with a new Web site and stepping even further away from their roots as Kentucky Fried Chicken. Their giveaway consists of one piece (manager’s choice) of the new bird for the asking. One piece per customer, of course. The offer is valid all day today at participating locations. El Pollo Loco’s deal includes a leg and a thigh and is valid until 8 p.m. at participating restaurants. It’s available for walk-up orders only — so no delivery or drive-thru. Breast substitutions are extra. Click here for full details. Who will be the winner of the battle of the grilled chicken? You will, of course! Any time you can get free food just for the asking, you win. Enjoy! For those of you with the Monday blues, here’s a good way to make yourself feel good and help support the arts as well. From 5 to 8 p.m. tonight (April 27), the dA Center for the Arts is hosting the introduction party Dale Bros. Brewery‘s late spring seasonal brew, Dude of York. Dale Bros. Brewery T-shirts and glasses will be available for sale with a portion of the proceeds going to the dA Center. Note to self: When eating at a New York-style deli for the first time, don’t start with falafel. OK, maybe I shouldn’t have ordered falafel. But I was craving it, and I knew that Innabi’s in Redlands was one of the closest places to get my fix. In fact, they have several variations: as an appetizer, served over hummus; or as a sandwich, wrapped in pita bread (my choice, $3.75), served panini-style, or as a wrap. Why, oh why, didn’t I order the turkey panini instead? It’s not that the felafel wasn’t good…it’s just that I should probably have started with something a little more deli-like. My lunch partner, Richard, made the smarter choice: the pastrami combo ($6.99), which came with a generous amount of lean pastrami on sourdough bread (they were out of the usual rye), steak fries and a soda. It’s late…so let’s cut to the chase. I’m not that huge of a burger fan, so it probably will be under my radar. Besides, if I’m in the mood for an expensive burger made just the way I want it, I’ll just drive out to Fuddruckers in Ontario. If you’re more interested in the Burger Bar than I appear to be, you can read her review here. More promising, if Allan Borgen’s 5-star review is any indication, is Taste of Asia in La Verne. Taste of Asia specializes in foods from Thailand, Vietnam, China and Laos. Laos? I don’t think I’ve ever eaten Laotian food before. La Verne is a bit of a drive, but I generally trust Allan’s reviews. If I’m in the area, I might stop in for a taste. You can read Allan’s review here. The 31 scoop, that is! It’s that time again…time for Baskin-Robbins’ 31 scoop night. From 5 to 10 p.m next Wednesday (April 29), participating Baskin-Robbins ice cream stories nationwide will be participating in this delicious event by offering small (2.5 ounce) ice cream scoops for only 31. In addition, Baskin-Robbins will be donating $100,000 to the National Volunteer Fire Council’s (NVFC) National Junior Firefighter Program. On top of that, Baskin-Robbins is partnering with the NVFC to honor 25 exemplary junior firefighters who have demonstrated outstanding commitment and service to their junior firefighter program. Chosen honorees will enjoy free Baskin-Robbins ice cream for a year and be featured on the NVFC Web site. Also, select Baskin-Robbins stores will be accepting donations for local firefighter charities. During last year’s event, Baskin-Robbins served more than four million scoops of ice cream! That’s a lot of Jamoca Almond Fudge! You know Dine 909 will be there, taking advantage of the three-scoop limit. Click here to find out more about Baskin-Robbins’ 31 scoop night. For more information on the NVFC’s National Junior Firefighter Program, click here. No, we’re not talking performance enhancing substances, here. We’re talking about a fundraiser for the Riverside Bengals Jr. All-American Youth Football and Cheer. It’s going to be held from 3 to 7 p.m. Saturday (April 18) at the Jamba Juice at 2653 Pats Ranch Road, Suite C, Mira Loma, in the Vernola Marketplace. Here’s how it works: Stop by the Riverside Bengals booster tent in the parking lot of Jamba Juice and pick up a flier to take into the store. Present the flier when you order and the Riverside Bengals will receive an amount equal to 20% of your purchase. Enjoy your juice! If your juice doesn’t make you feel better, perhaps helping kids will! The Redlands location of Romano’s Italian Restaurant (at 330 Orange St.) is now open. They were slated to open at noon yesterday, but they opened a little behind schedule, at 4 p.m.
Dine 909 was invited by the crew at the Redlands Daily Facts to join them at the new restaurant, but due to the change in opening time, we ended up at a different Romano’s. Of course, we still had a great lunch (I had the Roma Duo lunch special with a Caesar salad and Chicken Caesar Calzonetto, a delicious bargain at $6.99) and it was good to have another outing with the Facts folks. To read the Facts’ story on the ribbon-cutting, click here. So, go to Romano’s. And let us all know how it was. Love beer? Love the movies? Combine them! Director Anat Baron has created a documentary about the U.S. beer industry…described as a contemporary David versus Goliath story of small craft breweries against the corporate beer industry, chiefly Anheuser-Busch. Anat Baron knows of what she films. Although she is allergic to alcohol, she was previously general manager of Mike’s Hard Lemonade. Her documentary, Beer Wars, will be screened in a nationwide live event tomorrow (April 16) evening. The screening will be followed by a live panel discussion (unedited here on the West Coast) of the film and its topic, moderated by Ben Stein. Oddly enough, the live panel discussion will take place at Royce Hall at UCLA. Here in the Inland Empire, the event will take place at the AMC Ontario Mills 30 in, um, Ontario, and at in Riverside at the AMC Galleria at Tyler 16. If you include the low desert in your definition of the Inland Empire, it’s happening at Regal’s Palm Springs Courtyard Stadium 9 and at Cinemark’s Rancho Mirage River 15. It’s also taking place at Cinemark 16 Victorville. Click here for a complete theater listing and to purchase tickets.